Diabetes campaigns here in Australia never cease to disappoint me. They always tend to focus on the negatives, such as the complications and the hard hitting statistics which instil fear. Our campaigns lack positivity, and don’t do those of us living with the condition a lot of justice. In my humble opinion, a campaign for Diabetes Week is simple. One where we encourage people living with the condition to share their stories in order to help raise awareness. Diabetes UK always seems to do this very well, with positive, empowering campaigns that actually engage and involve people with diabetes. 1) A diagnosis does not mean that you’ll develop complications. I heard a lot about complications in the Australian media during the first year or so after my diagnosis. I remember feeling horrified about that possibility, and even writing myself off because of my diabetes in conversations. It took me a long time to realise that this was in fact, not true. I still remember a fantastic quote I found somewhere on the internet that went something like “you might feel like crap today, but complications can take years to develop.” It’s a great perspective and it always reminds me that it’s never too late. 2) Diabetes takes time to get right. A LOT of time. After I was first diagnosed, I remember talking to others in the context that I would eventually get it sorted. Once I had everything figured out, I wouldn’t need to test my BGLs so often and I wouldn’t be having so many hypos. Six years later, I’m still trying to get it right! My diabetes educator reminded me recently that “even though we want to do as much as we can straight away, it takes time to get it right and you need to be patient.” Be kind to yourself. 3) You don’t have to turn your life upside down or give up everything! Magazines are full of ways to change your life and feel better overnight and blah blah blah. Doctors talk as though change can happen with a wave of the magic wand. It’s completely unrealistic. I’ve made a lot of small, gradual changes to my diet and my routine since I was diagnosed. But I haven’t compromised on the things I love. I don’t do dedicated exercise, because I don’t enjoy it. I still eat chocolate. I still drink lots of coffee. I don’t peel the skin off my takeaway chicken. I still enjoy myself at Christmas time. A colleague recently told me that “it’s easier said than done.” While I do agree, I reminded her that it doesn’t mean that you have to be unhappy. 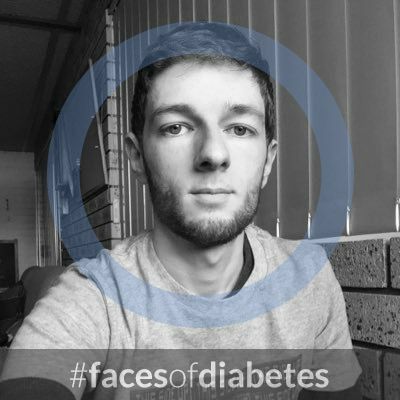 4) Finally, I’m loving the Faces of Diabetes campaign that’s going round on social media. Because there are actual human beings behind the condition, and it’s important to keep that in mind when advocating. You can get your picture here. Happy Diabetes Week to those of you in the UK! You can find out more at diabetes.org.uk and by following #DiabetesWeek on social media. Some health care providers need to realise, none of us want diabetes complications and this draconian approach to motivating diabetics by putting the fear of God into them by highlighting diabetes complications needs to STOP. In 1969 when i was first diagnosed i was told i would go blind, have my legs amputated etc………….I remember (as i was just 10 yo and had no access to any scientific data, not to mention no one even bothered to talk to me, i was talked over) EVERY night fearing i would one morning wake up blind and developed a high level of anxiety. Remember back then laser treatment was unheard of. After 35 years in health i am still amazed at how many HCP continue to lack the skills to realise the many barriers that present themselves to achieving blood glucose levels within range. HCP fail to realise or indeed to even seek explanation as to what these barriers are, rather using fear tactics as a motivator. Well it doesn’t work and HCP’s need to spend more time seeking the reason each individual is not achieving the “management goals” these HCP set out. Strategic National Goals and balancing this with what the person with diabetes can and wants to achieve and addressing BARRIERS are vital, but it is NOT happening. Take for example the current discourse about CGM, the diabetes community voiced it wanted to ease the burden by subsidies CGM or at least subsided newer technology to ease the relentless burden of glucose monitoring, it voiced clearly this should be for all diabetics whom are vulnerable, did we initially get heard: NO. So clearly the long term relentless burden is just one aspect of diabetes that it appears HCP’s don’t want to talk about. We hear all the jargon about “client orientated management for diabetes”, yet i still hear of diabetics being told “well if you don’t listen” or “if you are not going to help yourself i can’t help you”. When HCP start to put into practise that they are their to guild not only the compliant, the motivated and the “heroes” but also those struggling, those who have barriers they feel too embarrassed or ashamed to talk about, then and only then will those labelled “non compliant” whom generally “do not attend”, usually due to the fact they feel like failures and do not want to be subjected to further judgement or humiliation will start to feel supported in this relentless disease called diabetes that has far reaching effects on all areas of life. It is long overdue that some HCP’s start to look at “risk reduction” based on individual ability, address barriers to motivation by firstly FINDING OUT what these barriers are. For this to be achieved it is not that difficult, it is called “listening to the client”, with compassion and not bringing in ones own judgements. Why we need jargonistic crap to be treated in a humane manner by HCP is a reflection of a society so intent on PERFECTION it has forgotten our most basic needs, COMPASSION and ACCEPTANCE! Add to this some clinicians whom go outside their scope of practise when dealing with complex issues and have no formal training or idea offering platitudes like “love your diabetes” or “it’s ok to rant”, with the blessing of the so called esteemed Australian Diabetes Affiliations. Their are some diabetes clinicians and others in heath who are exemplary and skilled but they are few and far between. UK are a fantastic example of “client centre diabetes management”, as usual Australia lags behind some 20 years. I say their is no such thing as a “non complaint” diabetic only a system that has not approached this disease in a manner that addressed the “barriers” to “risk reduction”. We all get the complication aspect and if it were that simple then we would all be “compliant”, “good”, “well controlled”, “easy patients to work with” and what ever else diabetics are labelled with by some HCP’s. Some under developed HCP’s need to stop feeding their own egos and realise own successes or failures are simply because we are all afflicted with this human condition called “life”. We all want a diabetes clinician that will accept our success, our limitations and our failures, at whatever stage of life. IT IS NOT HAPPENING ON A LARGE SCALE in Australia but beware, voice this and reprisals can and do take many overt and covert forms.